Mirrored rattle with colourful beads reflects light and the textured handle is easy for baby to grasp. Multiple colours and rattle sound keep baby entertained. The purchase of this product helps support the Pink Power Mom program benefiting breast cancer charities globally. To learn more, visit pinkpowermom.com. No batteries required. 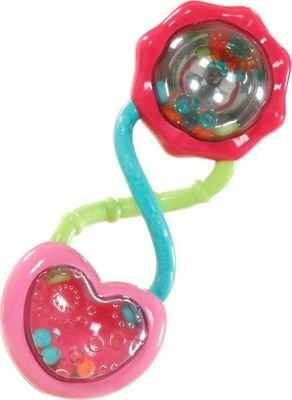 Mirrored rattle with colourful beads reflects light and the textured handle is easy for baby to grasp.